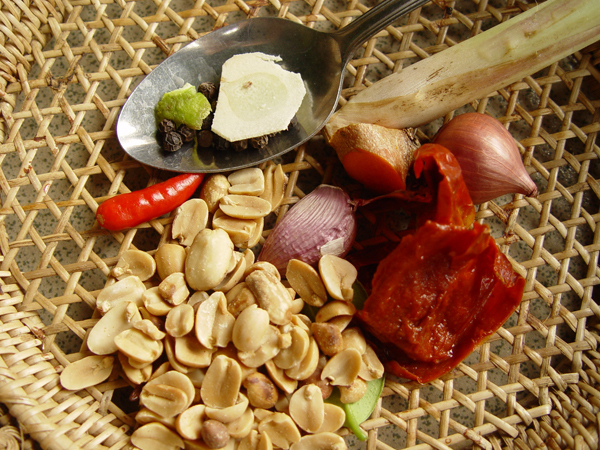 I've just gone through all 14 pages of Elsewhere in Asia, and there was not yet a thread for Cambodian cooking. At least I don't feel frivolous. Following on Rona's thread postings in the Eating in Cambodia thread , and the happy coincidence of finding the cookbook by the chef of Sala Bai, Joannes Riviere - Cambodian Cooking - I've decided to go on a Khmer cooking binge. At least until the family mutinies (again). The cooking is fairly straightforward, a quick stir fry, and suited to a worknight like tonight. Serena's off to ballet, Yoonhi steams some green beans, the rice is almost done, and my stuff is ready to throw in. Drawing on Vietnamese influence, the beginning is caramelizing some palm sugar. 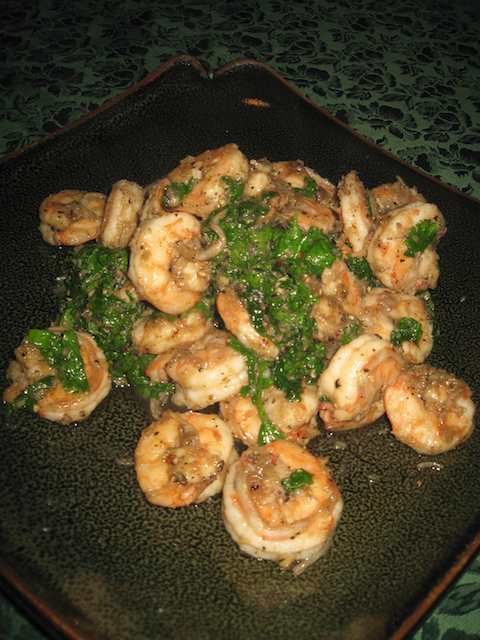 Then I tossed in the prawns, a bit of oil, and garlic. Let the sugar glaze on while the prawns cook, and then, after 2 minutes, hit it with some fish sauce for salt, a tablespoon of fresh crushed black peppercorns (Thai, although I don't know if that makes a difference), and then a handful of cilantro/coriander leaves as I pull it off the heat. Like Riviere says in his book, these are not difficult recipes. In fact, most of them are perfect for a quick meal. I like the contrast of this with many of the Lao and Thai things I do. 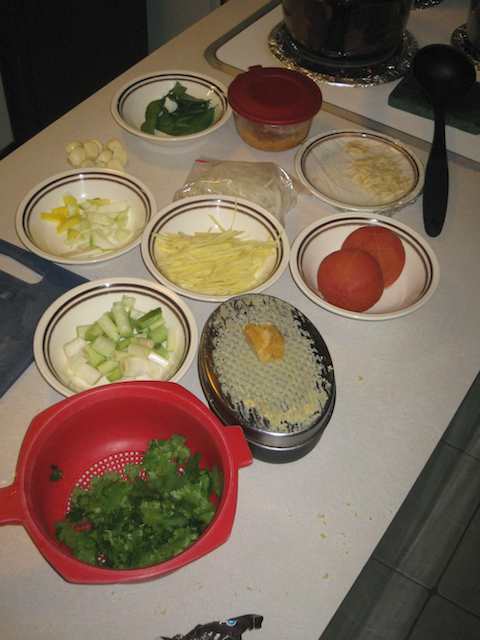 which call for may more prep time (cooking is quick, but there's a lot of work in advance). The Khmer were cut off from overseas trade by their neighbors ("guns, why would you want guns? 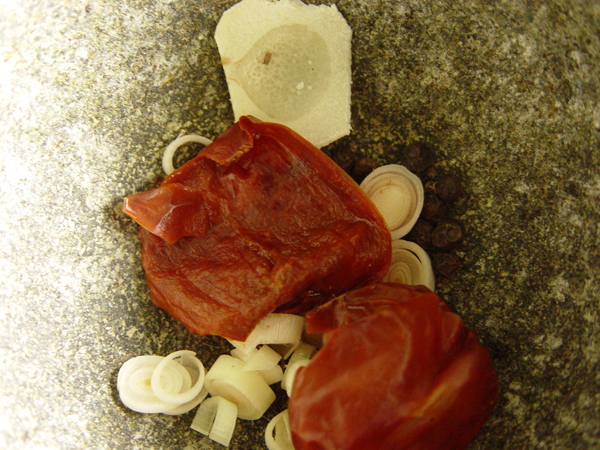 We'll protect you from those other guys") for ages, and this impeded the penetration of chili and other traded spices. What I look for in Cambodian cuisine is more of fresh herbs and peppercorn, shielded from the burn of the Western neighbors, but still very distinctive from the Viets. 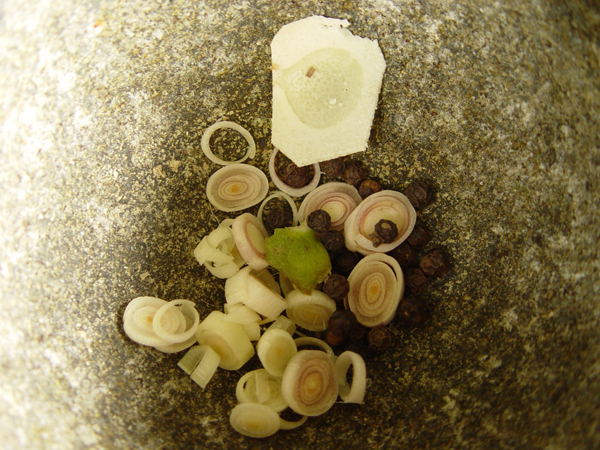 This delivers the fragrance of the coriander just opened up, and a bit of burn from the peppercorns and garlic. The prawns, to me, are an afterthought (but you've got to have something to digest!). My only complaint is of my causing. I'd been too lazy to unlimber the MI unit (which entails shutting down the computers on this side of the house). Like most stir fries, this needed a higher heat than my ^%$^#$% electric range could deliver. I wont make that mistake twice (five or six times, but twice is way behind me). I'll be following this topic with interest and participating whenever I can. I'm most interested in figuring out rice noodle dishes, which have always been my favorites at the (several) Cambodian places around town. Peter, what else in that book looks interesting? YES! I know nothing about it but figure if it is from that area of the world it will be very tasty. If the first dish is any indication it will be wonderful. I'll probably concentrate on the stir fries for the next couple of days (mainly because they're fast to prepare, and I know never to let a Korean go hungry). The barbecues, however, look really interesting, with the reliance on pineapple in the marinades to soften the meat (but these are 24 hour preps, so they're for later). The soups are also something I'm interested in, as the broths rely (again) more on herbs than the full frontal of some Thai dishes (although I still think it's hard to beat the comfort of tom kha kai). And the rest, well, we'll see. P.S. - As usual I'll cheat, and make use of my Khmer friends to advise! P.P.S. - I forgot to mention (again) that Johannes Riviere's book is in support of the charity Act for Cambodia I'm a hard sell, but the Cambodians are one of those people I really do think we need to help. Thanks for starting a thread about this little known cuisine (at least for me) -it'll help me soak up some knowledge and thrust away some of my ignorance (goodness!). I'm particularly interested in amok trey, which I've read about in at least two of my Asian cookbooks. I saw that book when I was in Cambodia, and considered getting it, but there was another book I thought was a little more interesting (though not as pretty). I didn't end up getting either of them, though. Our bags were already too heavy! Is there a recipe for the Cambodian version of larb in there? That was the only Cambodian dish we ate that we really enjoyed. I did a quick leaf through. No larb. There's a chicken salad, but it's sliced breast. Do you recall what they did that was different from Lao laab? Was this in Siem Reab of Penh? i liked chicken soup with preserved lime that i had in PP across the street from the central market. chuck everything in a soup pot and cook until tender. that's how i do it. I did a cooking class while in Phnom Penh and cooked amok, Cambodian-style curry, and banana flower sausages, which were all delicious. I took meticulous notes and step-by-step photos for this forum, which I have never bothered to upload. Because I am lazy. 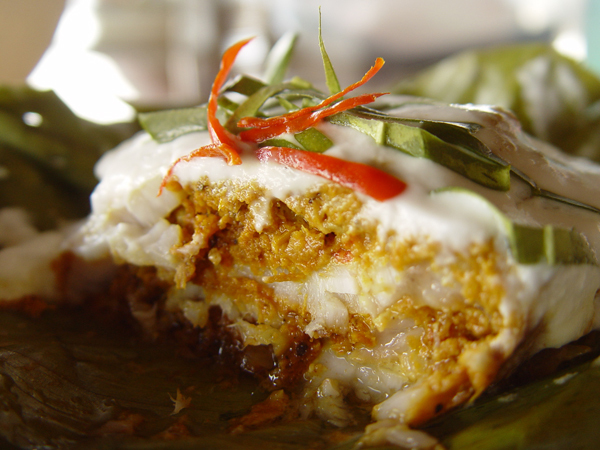 My favourite by far was the amok, which layered delicate slices of fish with a thick kroeung and coconut cream. 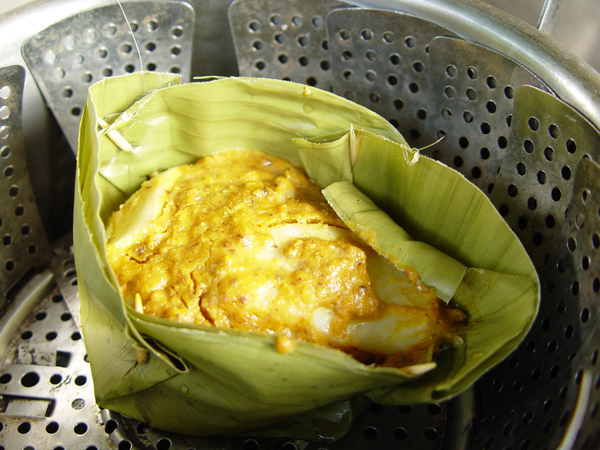 When I had this dish in restaurants in Siem Reap, I was unimpressed, but when I made it, it was spectacular. I haven't had access to most of the ingredients since leaving SEA, but if anyone's interested, I'll post the photos and method here. 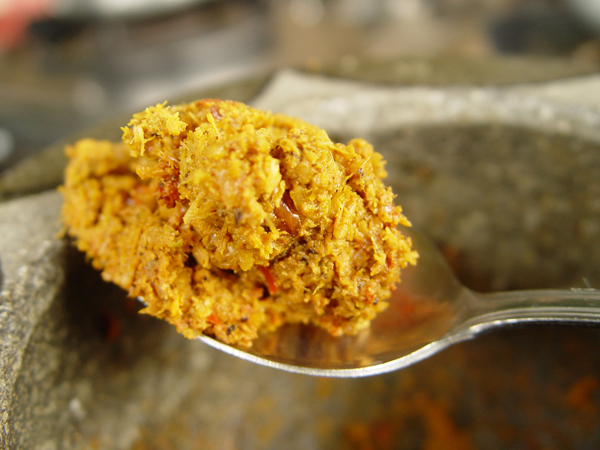 How does kroeung differ from Thai pastes? 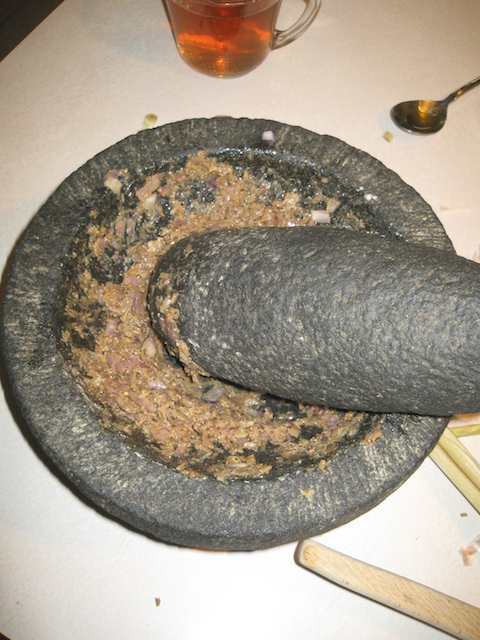 Are the benefits of pounding out your own as noticeable with Khmer food as with Thai, or are there some reliable brands to try? This was a good combination, as the fish takes a while to cook, and the pork is pretty much on the spot. Fpr the sweet and sour fish, we prepped garlic, tomatoes (I removed the skin), 2 small green mangos (in slices), basil and coriander for garnish. For the pork, we cut the pork in shreds. I only had belly at hand, but that's okay by me. And then we julliened a hunk of ginger and appropriated the whites of spring onion that were left in the fridge (the greens went somewhere else). This sounded interesting, as they get the sour element not from vinegar, but from the green mango's tartness. Oh, and I put Serena to work grating the palm sugar. 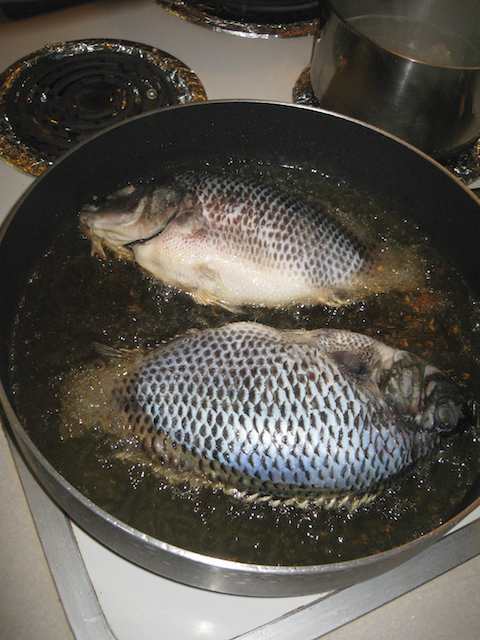 The fish is browned to gold, and then set aside. Then, garlic, sugar, and fish sauce goes into the pan and is taken just to caramelization. At that point, you dump in the green mango, tomato chunks, and stir fry for "a few minutes". 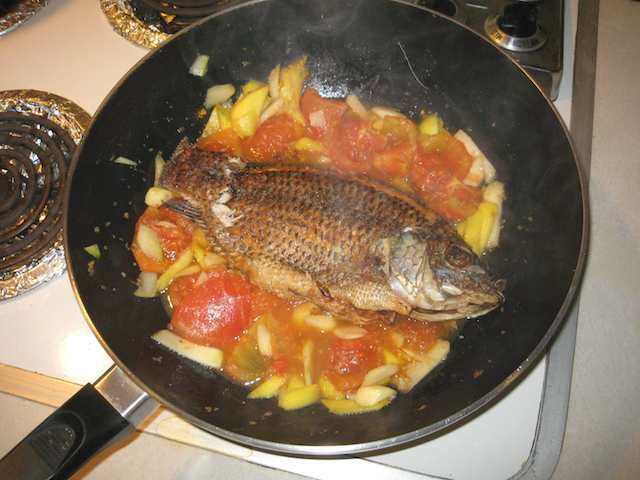 Once that's broken down a bit, you place the fish in there, lower the heat, and let it simmer for 15 minutes. Once I'm within a 5 minute target on the fish, I start in on the pork. First, the Khmer treat ginger as a vegetable (it says in the book) "rather than a spice or aromatic". It gets a quick saute in the oil at medium heat, just enough to bring it to translucence. As this hits the oil, the entire kitchen lights up with a smell of ginger that just cries out "cocktails!" to me. (Yoonhi says everything cries out "cocktails!" to me, unless of course it's yelling "beer!" or "Maekhong!" or some other variant). Then our beautiful belly goes in and the heat goes up. Get this belly browned, like a Nordic banker on the beach in Sihanoukville, and then add in the spring onion, soy sauce, and sugar, and finish the fry up. Add the basil, and remove it from the heat. 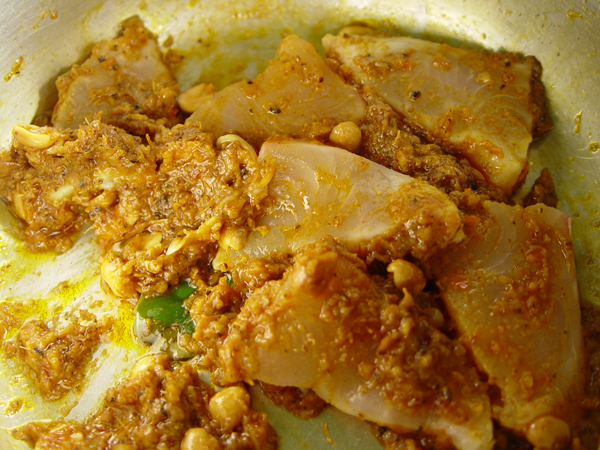 The fish gets plated,and the coriander and remaining basil goes on, wilting into the dish and opening up the aromatics. Yoonhi's startled by the green mango's tartness, balanced by the palm sugar. 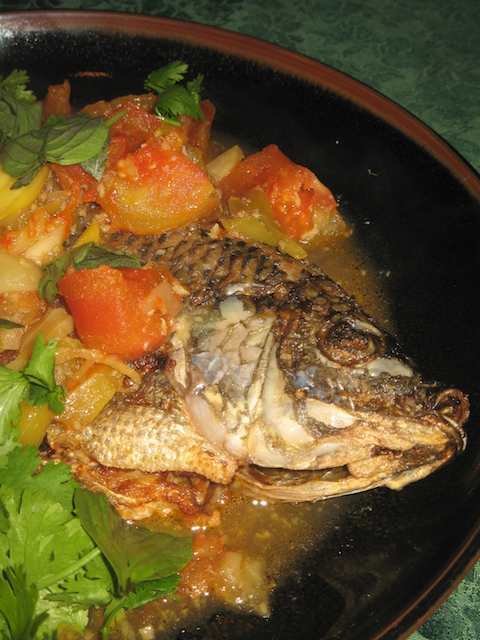 The flesh of the fish is very good, with the sauce's sweet and sour elements having penetrated into the overall flavour. This is in contrast to a lot of recipes that want the fish crispy, so the green mango sauce is kept separate until the end. The pork....well, it is belly, so it's hard to go wrong. 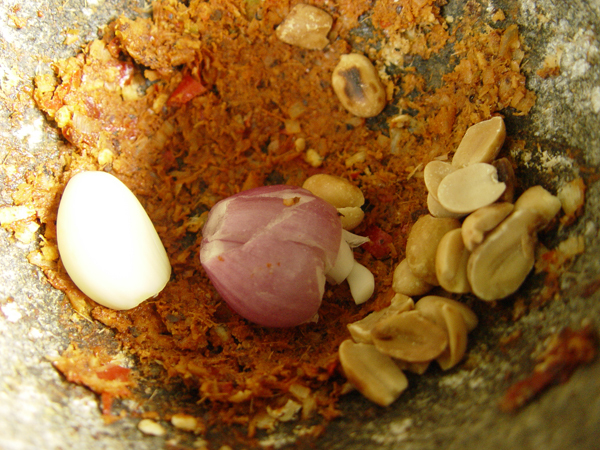 The ginger is very nice, done in this fashion, and the overall effect is very Chinese, but with that herbal fronting that distinguishes the Khmer dishes. Both of these dishes would seem to have Chinese roots. 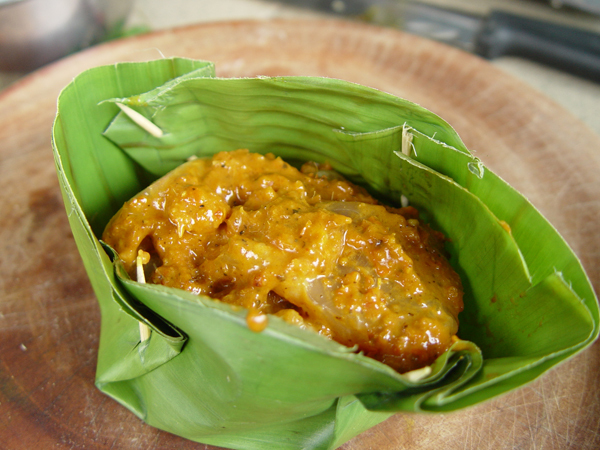 The fish, as a sweet and sour, is more of an abstraction, the green mango being a good innovation. The pork, being pork, is more traditional in many ways. The only difference (to me) is the sautee of the ginger, rather than juicing it and using it in the sauce or marinade. 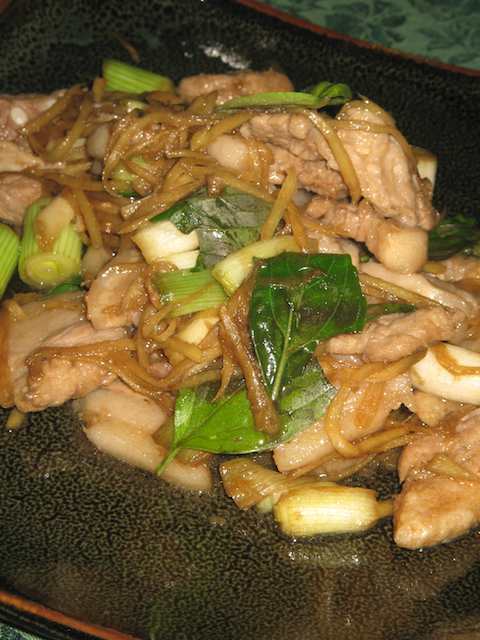 Pork, ginger, green onion....that all seems very Chinese to me (but what do I know?). Both good dishes, and both fairly simple to put together. The fish, perhaps with a grouper so it would serve more, would make an excellent centerpiece at the next party, and the pork will keep everyone happy, although my one caution is that it has to be eaten quickly, as the fat does congeal in the air conditioning here. There, that's it for today (at least from me). The tomato/pineapple combination is genius. Does anyone know when or how tomatoes made their way into Khmer cooking? Tomato and green mango combination, I think you meant? Or do you mean the tomato pineapple we see a lot of? In both cases, my hats off to the chef who first came up with this matching. I'll hazard a guess, and put the tomato down to the French, as the Khmer were cut off from the early imports by their neighbors to the East and West (hence the conspicuous lack of searing chilis in most of the dishes). I suspect that many a French officer would keep a small garden at his station for those items that were crucial to one's existence (I've a copy of Normal Lewis' A Dragon Apparent around here somewhere that I must reread). Please, please, please - photos and method - please? I haven't had access to most of the ingredients since leaving SEA, but if anyone's interested, I'll post the photos and method here. 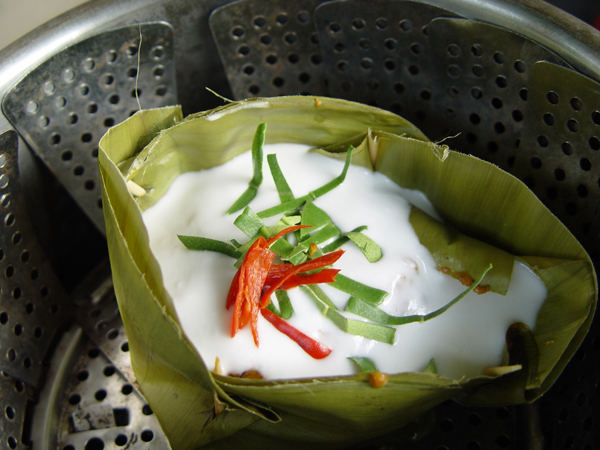 I may be entirely offtrack since, as I said before, I have very little knowledge of Cambodian cuisine, however, I have read that there is a fair amount of Chinese influence in Cambodian cuisine, much like many other South East Asian cuisines. Which is all very natural as the Chinese really do get around (question is, where haven't they been?) -larrgge numbers of Chinese immigrants have settled in Cambodia, Vietnam, Thailand, etc. My own family is a result of adventurous Chinese travellers ha. Anyway, a perfect eg of Chinese culinary influence would be the popular Khmer noodle soup known as "kuyteav" (and...I think...in Vietnam as "hu tieu"). This was apparently brought over by Chinese immigrants. Then, if I'm not mistaken, we have BonVivantNL up there mentioning Chiu Chow sour duck soup. Again, Chinese. Whatever though, you probably already know all this and I'm just resonating your thoughts lol. There seems to be lots of Vietnamese influences in Cambodian cuisine too...I spoke about this before. We started off in the stir fries, so I figured it was time to move to the barbecues and roasts. For the chicken, the roasting is done clay-pot style. 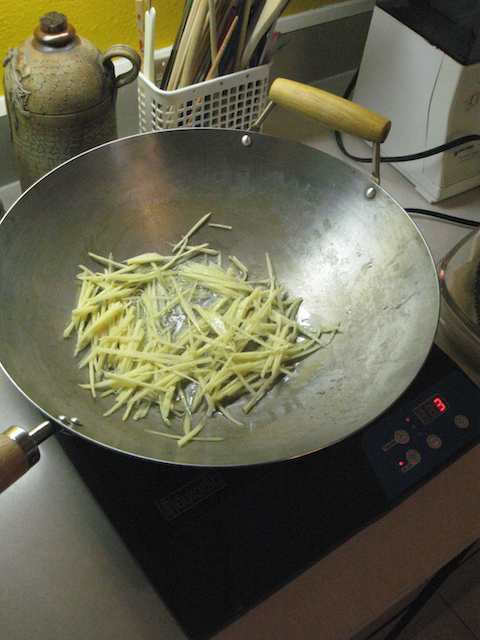 You chop up a mass of lemon grass, kaffir lime leaf, shallot, and garlic, and cook this first in the bottom of the pot. Meanwhile, you've rubbed your chicken down with a mix of honey and salt. 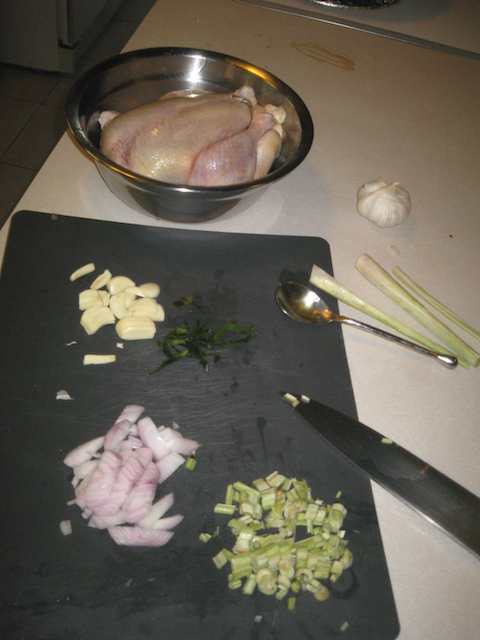 Once the aromatics open up, you drop the chicken in and cook it for five minutes with the cover on. Then add some rice wine, and cover again, cooking for an hour, turning it from time to time and adding more wine (somewhat how I like to be taken care of when there's a roaring fire). Meanwhile, the meat is being prepped. 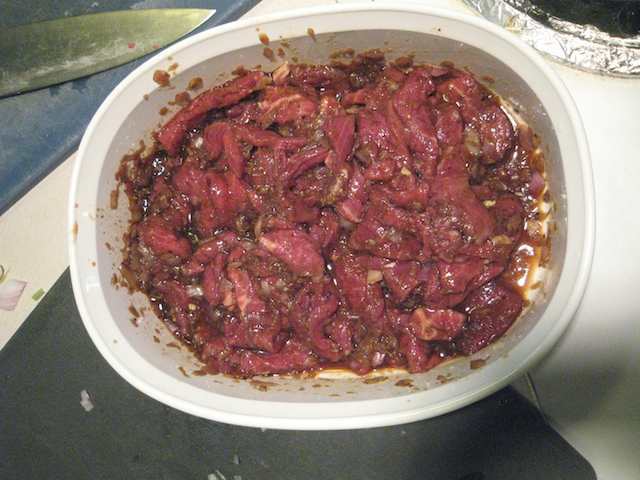 Black pepper, garlic, lemon grass, and shallots are pounded down to a pulp, and then mixed in soy and palm sugar, and used to marinate the tenderloin. It then sits in the marinade for the hour the chicken is cooking. 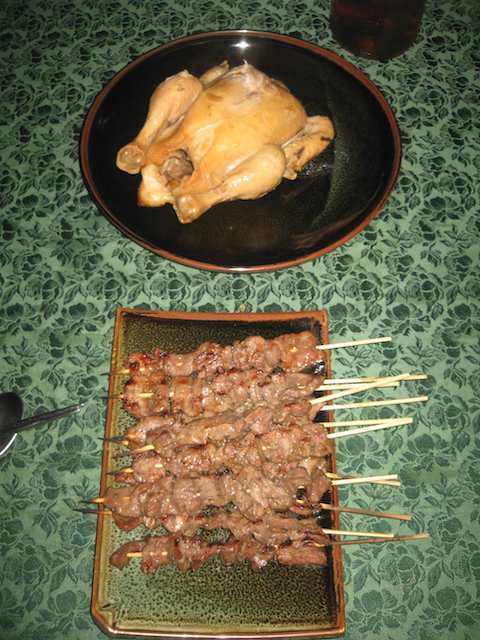 Towards the end of the chicken's roast, I pull the cover off the bird and put it back in the oven, and toss the skewers on the grill. I really like the skewers. These came out just right, not cooked too much, but rather juicy, with the odd flavour combination that says "Indochina". I could eat a lot of these, but they do need rice, as the soy gives them a salty feel. The chicken's another matter. Having cooked with the cover on, we don't get a really good glaze, and the flavours aren't strong enough to really impact you. There is an interesting thread of citrus in there, which must be the lemon grass and kaffir lime leaves interacting, but overall the meat comes out dry, and rather bland. If I was to do this over again, I'd use my smoker rather than clay potting it in the oven. To be fair, the book does advise that the Khmer will put the clay pot over a wood fire to get the smoky smell, and I think chips in the smoker, with the aromatics in a separate bowl with wine below. Give it 3 hours in the smoker, and this could be really interesting. 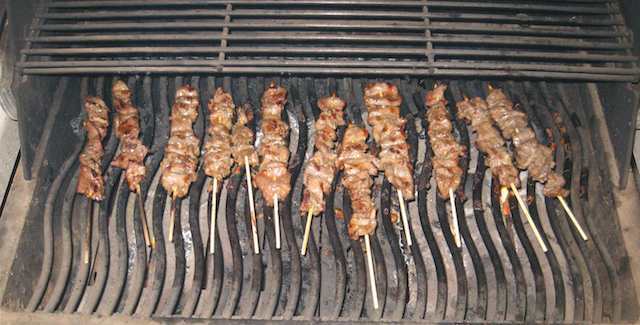 The skewers were fine, but I'm thinking I should invest in a shallow metal trough and just start charcoaling things. That immediate presence to the heat is something I can't do on the barbie. Overall, a good meal. But not as good was what we did last night. You see a lot of noodles and dumplings everywhere. Peter, is the rice wine shaoxing or something else? I mentioned earlier that Joannes' book was for Act for Cambodia. They're not specific in the book. shaoxing is a fermented wine, and they suggest sake (which would probably indicate good mirin) as an alternative. They're thrust was that the light alcohol (relatively) of the wine allows the herbs "to release their flavour gently while the meat remains tender". 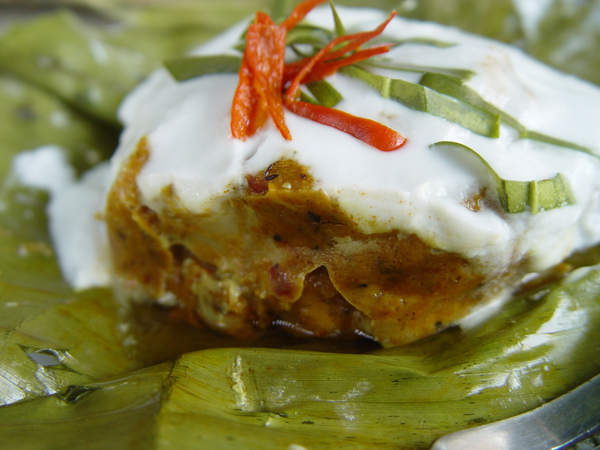 This recipe comes from Frizz restaurant, in Phnom Penh. It runs a cooking class, which I highly recommend. 2 dried red chilis, soaked, drained, and chopped. 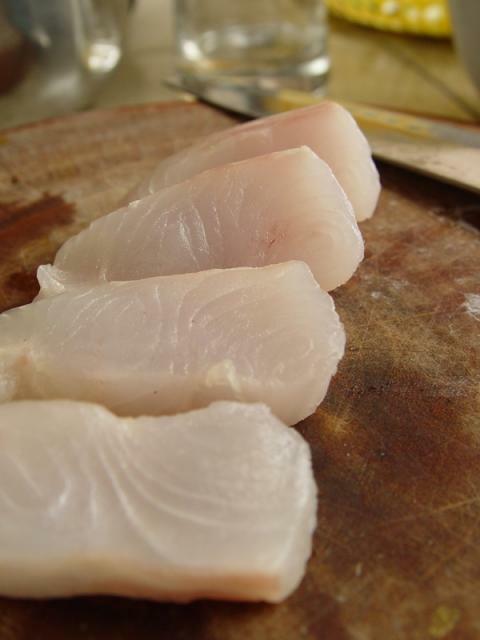 Then, take a filet of firm white-fleshed fish (Around 400g). Slice. Meanwhile, rig up some sort of leaf infrastructure. 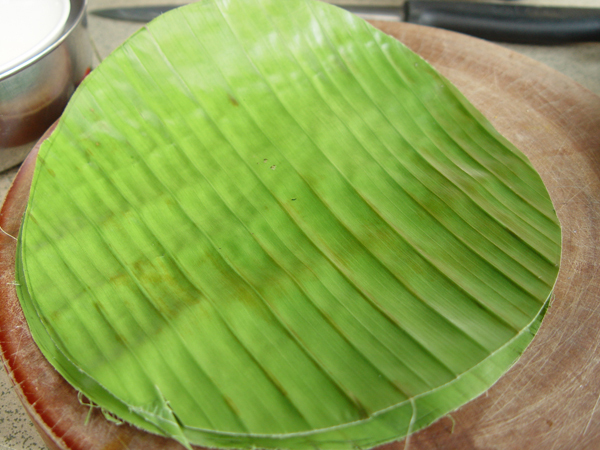 We used "nhor" leaves, which I think are banana leaves. Cabbage is suggested as a substitute. 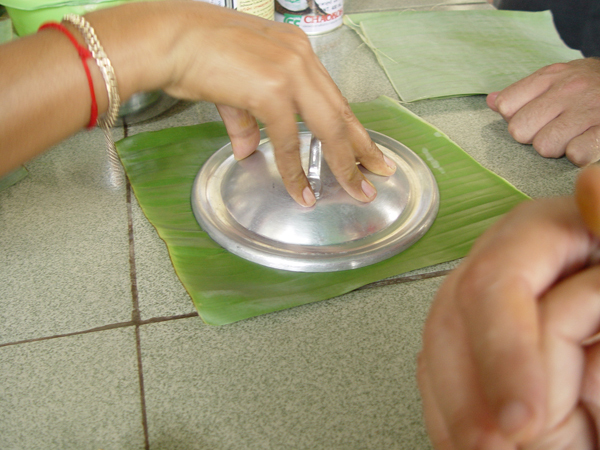 You must use two leaves to form the cup, as one will not be strong enough to support the cup. 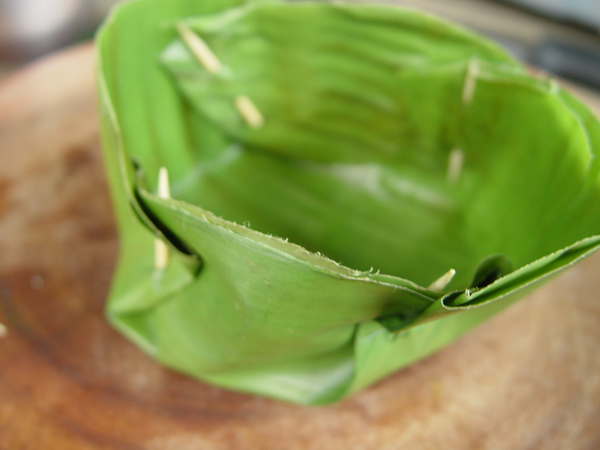 Fold a bit of the leaf in four places to form a cup, using toothpicks to secure the folds. Then spoon in the mixture. When it reaches this stage, top the cups with coconut cream - you can do this by using canned coconut cream or reducing coconut milk until thick. Top with slivers of red chili and kaffir lime leaves. That looks great -- and those certainly look like banana leaves to me.